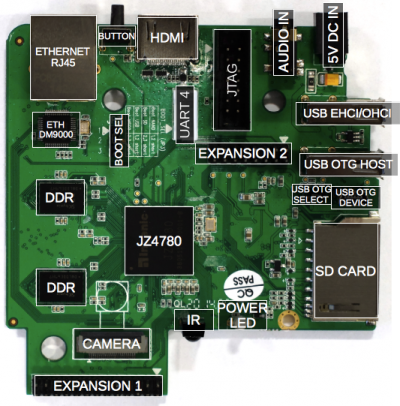 This page details the technical specifications and components of the MIPS Creator CI20 development board. I2C One port on primary expansion header. Note: i2cdetect incorrectly shows some I2C addresses as full. Despite this, the I2C block works fine. USB mini-OTG connector J8 Paralleled with the full size A connector next to it. Button SW1 Boot time selector (see boot selector table). Can also be read from software as GPIO. Note, this is not a reset button! Boot mode selector JP3 Used to choose auto-boot from NAND or SDcard slot, predominantly. Primary expansion connector JP4 26-pin (2x13) 'RPi compatible' 0.1" pitch expansion connector, carrying power, UART, SynchronousSerial, I2C and GPIO functions. The power connector is a 5V 4mm (shield) x 1.7mm (pin) center positive connector. It takes 5V only. Note that this connection is identical to that of the original Sony PSP, so power cables intended for that console also work for the CI20. Full sized HDMI connection with audio out support as well. The HDMI block on the JZ4780 supports HDMI v1.4a, and appears to be a Synopsys DesignWare HDMI controller, although this is not documented in the JZ4780 programming manual. In the 3.18 kernel the code is found at drivers/gpu/drm/jz4780, but seems to live in a more generic form at drivers/gpu/drm/bridge/synopsys/dw-hdmi.c in the mainline kernel. Paralleled with the mini-OTG connector. Connected to the EHCI USB controller in the SoC. Is paralleled with the left hand USB A connector - do not plug into both of these at once. Has the OTG VBUS controlled by the jumper next to it. Jumper shorted = HOST mode. Jumper not shorted = Device mode. 10/100 RJ45, connects to the DM9000 chipset. Standard 4-pin headset connector, with auto OMTP/CTIA detection (so should work with any standard 4-pin headset). The button between HDMI and Ethernet is not a reset button - it is boot_select0. Combining this button with JP3, it is possible to boot the Ci20 from USB or MSC0. Once the kernel has been loaded, the button can be used as a GPIO - it is pin PD17. See the silkscreen on the board and the section at the end of the JZ4780 programmers manual. Fundamentally you can boot from the on-board NAND or direct off the SDcard without having to press the button during boot. There is also a USB boot function available, but it is not a standard DFU type boot, and requires JZ4780 specific host support. Standard pinout full sized SD/MMC slot that can be used for direct booting, or for bulk storage (standard MTD support under Linux). It is wired to the MSC0 block in the SoC. 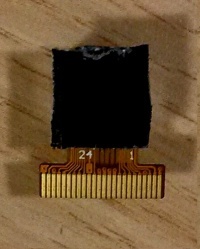 The camera connector is 24 pin (26 pins on the schematic - two of which are the side ground solder tabs on the connector itself - the actual cable interface is 24 pin), and CMOS DVP 8-bit camera compatible. Note Be aware that there are some SMT components directly under where the camera unit sits. If your camera unit has a conductive rear surface then this may short out on the board. Symptoms we have seen include board resets. Please insulate the area either on the PCB or the back of the camera unit to avoid this. The CI20 has an infrared remote control receiver (part IRM-2638A, carrier frequency 37.9kHz), which is connected to GPIO PE3 for software decoding. Version 2 of the Ci20 board adds 4 red activity LEDs. These LEDs are exposed via sysfs as described here. Version 2 of the Ci20 board adds a system reset button. Pinout and other functions of the dedicated UART header. This is uart4 of the SoC. Note that uart0 is on the 26pin main expansion header. 14-pin MIPS EJTAG headers. See proposed OpenOCD/wiggler support project. By default, the pins that UART3 is exposed on are used for EJTAG. UBOOT needs to be recompiled in order to modify this and you need to have compiled your own kernel from the Ci20 git repository. Follow the steps for building UBOOT from source, but stop just before running make. Save the file and continue following the steps for building UBOOT from source. The CI20's SOC is an Ingenic JZ4780 - see the data sheet and programmers manuals referenced on this page. 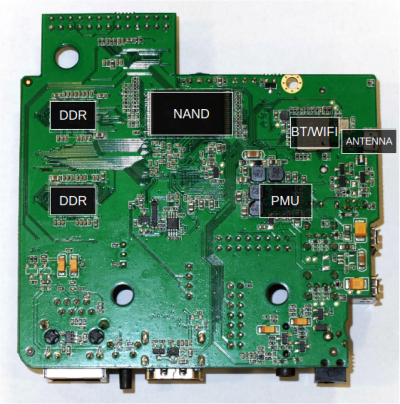 Is provided by a single Samsung K9GBG08UOA NAND flash, using an 8bit data interface to the SoC. Is provided by a Davicom DM9000C connected via an 8-bit interface to the SoC, providing 10/100 ethernet. 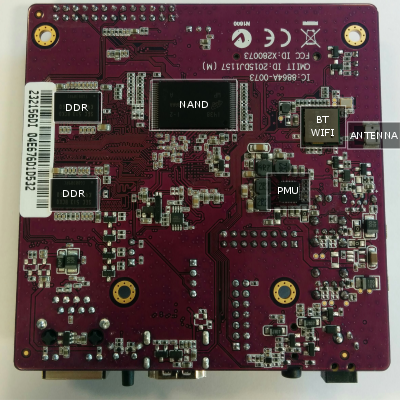 Is provided by an Ingenic IW8103, based on a Broadcom 4330, connected via SDIO to the SoC's MSC1 port. Is an Active-Semi ACT8600 specifically designed for the Ingenic JZ family of SoCs. Is provided by a Pericom PT7C4337UE connected to the SoC via the I2C_4 bus. The automatic 4-pin microphone switching/detection is provided by a Fairchild FSA8049 audio jack detection device. Description of the (rather small little silver dot) test points on the board, derived from the schematic. TP19 BOOT_SEL2 boot mode setting - pulled high to 3.3V with a 10K resistor. 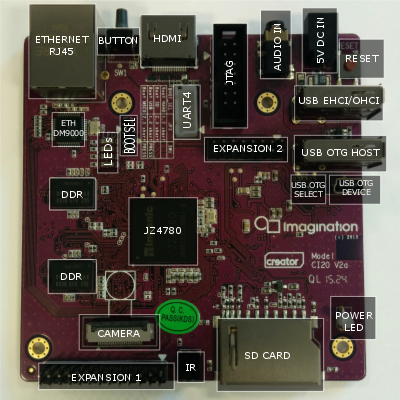 The following links provide information (predominantly PDF files) about the SoC, board and components for the MIPS Creator CI20. This is the current board being sold. The board ships with a USB Power cable. Fix in silk screen boot select and logo. Part of the developer giveaway. Note: All parts are untested and links are given as a reference for specification only. The following are possible accessories that can be used for the board. The CI20 power connector is the same as the one used for the Sony PSP. So a PSP power supply can directly work. Note: There is a lot of variation in these cables and USB power supplies. If your board randomly dies, power supply/cable can be a possible issue. USB WiFi adapters usually rely on closed source firmware blobs. And in-tree kernel support depends on the actual chipset in them. Devices with different/same model numbers can have slightly different device id's and chipsets. This makes driver support tricky. The following devices have been tested. This page was last edited on 13 September 2018, at 08:40.